Palestinian campaigners angered by exhibition at Parliament showing Israel's contribution to science, medicine and technology. A demonstration is expected to be held outside the Scottish Parliament over an exhibition being held there to promote Israel's contribution to medicine, science and technology. The decision to run the exhibition has been criticised by the Scottish Palestinian Solidarity Campaign. The exhibition is being sponsored by East Renfrewshire Labour MSP Ken Macintosh on behalf of the Scottish Friends of Israel. It consists of exhibits detailing scientific and technological innovation that Israel has been instrumental in introducing, such as technology used in mobile phones and computers, as well as medical research in physics and stem cell research. He added that two constituents had suggested putting in the exhibition, and he had no hesitation in sponsoring it. Myer Green from Scottish Friends of Israel said: "Whilst the exhibition is intrinsically non-political in its content, it was motivated by the torrent of hostile petitions heaping opprobrium on Israel. We thought that the best measure to counter the flow of one-sided information was this kind of exhibition." Green MSP Patrick Harvie raised a motion in parliament over the issue, calling for the Parliament to recognises the feelings of anger that exist towards the record of the Israeli Government’s treatment of Palestinians, and expressed concerns that the exhibition would give the impression that the parliament condones the record of the Israeli government. Meanwhile, Ken Macintosh raised a motion calling the parliament to consider that one-sided coverage fo Israel and the middle east is more likely to confirm prejudice than promote understanding, and believes that it is wrong to continually portray a whole country and its people in hostile and negative terms. 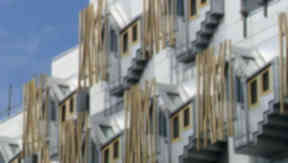 A petition submitted to the Scottish Parliament calling on it to cancel the exhibition attracted over 1100 signatures. However, the Scottish Parliamentary Corporate Body gave it the go-ahead after it found that the exhibition met with the criteria for MSP sponsored exhibitions and also met with the criteria of providing information relevant to MSPs about a specific and relevant issues. Mick Napier from the Scottish Palestine Solidarity Campaign described the exhibition as "propaganda" and said: "White phosphorous on built-up areas is not the kind of science we should celebrate. As noted by the committee, if the rules permit a ‘rogue state’ to promote its capacity for death and destruction, then clearly the rules need to be changed." The exhibition was originally displayed in Eastwood Theatre in Glasgow as part of events marking the 60th anniversary of the state of Israel. The exhibition opens in the Parliament's garden lobby on Wednesday.